My first experience with leeches was as a seven year old and we were looking for mushrooms on a nearby farm. Being a young boy I decided to wade in the dam “Oh look I say to my parents there are little eels in the dam and they’re swimming towards me”, Not! Leeches can be reasonably common in many areas that we hike in, areas of the Overland Track can be a real issue if you are camping on the moist grass. Two hikers we talked to set up their tent on grass near New Pelion Hut and within minutes of entering the tent there were a number of leeches climbing up the mesh door looking for a free meal. Leeches prefer damp areas particularly near creeks, rivers waterfalls etc and while they don’t particularly bother me, and aren’t really dangerous, they are just one of the many reason that I prefer desert environments. For most people its the yuck factor with Leeches as they usually crawl up your leg and attach themselves before feeding. I have even heard of reports from hikers where they have attached themselves to peoples eyes. The image below was taken on the Corn Trail which is well known for Leeches and this little guy was at full stretch working its way up my partners leg. I had to do some convincing to leave it there while I took some quick photos. Leeches feed on blood and will attach themselves to areas of bare skin to feed. As part of the feeding process their saliva contains a substance called Hirudin which is an anticoagulant which makes it easier for them to feed. They will usually consume several times their own body weight in blood and look quite bloated by the time they have had their fill which is when they will release and drop off. 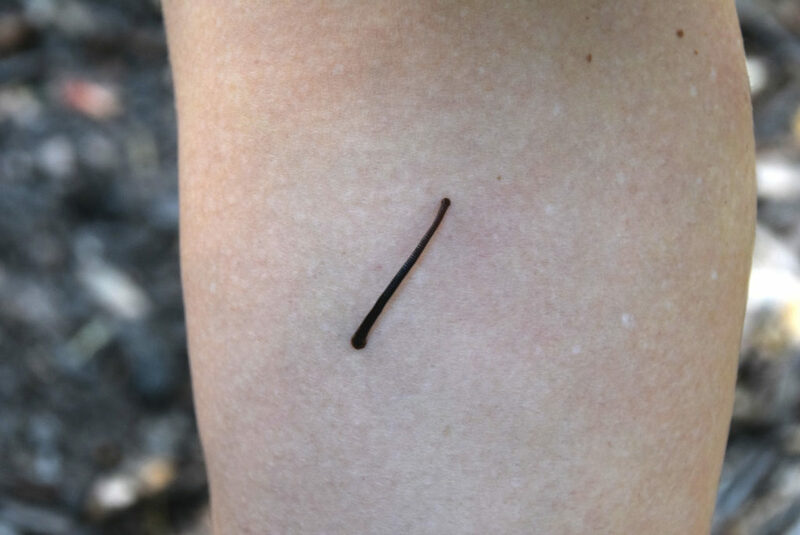 I have been with hikers who have complained about having a wet sock only realise that a very fat leech is sitting there on the top of their sock and there is now blood dribbling down their leg. While leeches aren’t dangerous some people can suffer an allergic reaction and there is always the potential for infection so you do need to keep an eye out if you fall prey. The best way to avoid Leeches is with preventive measures. In areas with high Leech activity ensure that you have an enclosed shelter at nighttime to prevent them finding you while you are asleep. Let the little blighter(s) finish feeding and they will drop off usually around 30 minutes after they start feeding. Alternatively if you want them gone ‘now’ locate the skinny end of the Leech (the head end) and with your fingernail scrape sideways. You may also need to scrape the other end off as well. Apply a disinfectant and cover the ‘bite’ area to minimise any risk of infection. I must admit that I usually don’t worry about doing this but that is purely a personal choice.